Dimitar Panov Ivanov (1902-1985) is Bulgarian dramatic actor. His debut on the stage of Plovdiv Drama Theater goes back to 1955, in a play called “Checkov’s Performance” (five small-scale comedies), where he plays the part of Savelii. 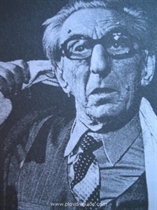 In 1959, Panov got a position as an actor of the Plovdiv Theater, which he did right until his death in 1985. He also directed some of the performances – “Krechinsky’s Wedding”, etc. He also worked with the Plovdiv State Opera – he played the role of Frosch in the operette “The Bat” (1959) by Johan Strauss, as well as Menelaus in the “Beautiful Helen” by Jacques Offenbach. He also played in a number of films. In 1983 his autobiographic book “Life is Only One” got published.